The Swedish company Brodit specializes on well thought-out and solidly constructed active & passive holders for mobile computers, tablets, label & mobile printers and forklift terminals from leading vendors. Brodit offers versatile accessories for every holder – this way, the holders may be adapted to nearly every mobile or stationary job site, as well as individual requirements. Brodit holders are therefore extremely versatilely usable in warehouses, transportation and logistics, and they offer big benefits. Among others, they may be combined with bar systems, which means they are suited for both outdoor & indoor areas, such as in packing stations. Included in the Brodit portfolio are active and passive holders for mobile computers in vehicles and forklifts, pedestal mounts in different sizes plus accessories, lockable holders, table mounts and pipe clamps, as well as charging trays and charging cables. You receive Brodit active holders with a cigarette lighter connection, as well as for the fixed mounting of devices from the leading vendors. The passive and active holders are available with and without a ball joint. 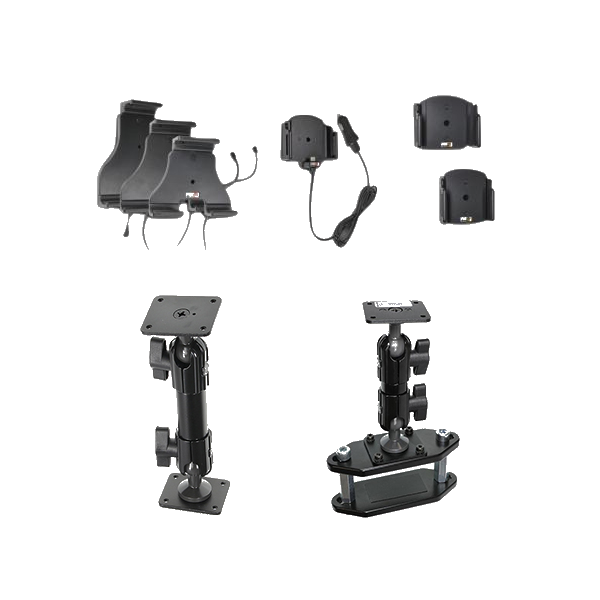 To order the Brodit holders and mounting accessories simply contact your sales representative. Make the call today!